Ashdown MAG Rootmaster range of bass heads and combos premieres at NAMM 2014. Ashdown has unveiled at NAMM 2014 the new MAG Rootmaster range of bass heads and combos. 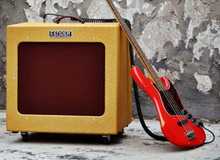 Along two new guitar amp heads, Orange introduces at NAMM 2014 a new 1000W bass amp head. Radial Engineering announces the new Bassbone OD for the NAMM Show 2014. Warwick Amplification to introduce at NAMM 2014 its new LW speaker cabinet series with eight models. Mesa Boogie introduces the Bass Strategy 8:88, a new all-valve 465W bass amp head for power fans. Imagine for a moment that a fellow dressed as the mailman shows up at your door when you are about to start playing your favorite instrument: "Ding-dong! It's the mailman! I've got a parcel for you!," says an affable figure, all sweaty, with a tone that is meant to be cheerful. TC Electronic invited some of the most famous danish guitar and bass players to cook some TonePrints, and will offer a lucky winner a pedal.